The village of Gilsland sits on the borders of Cumbria and Northumberland, with the River Irthing being the county boundary. Just off the A69 half way between Carlisle and Hexham, the village boasts plenty of history especially Roman with Hadrian’s Wall World Heritage site running through the whole region. The area can also boast some beautiful countryside and spectacular scenery. Situated in the centre of the village the hall was originally built as a hall and reading room in 1894. In recent years it has undergone a major refurbishment and is now a warm comfortable venue for a range of activities. The now fully insulated hall uses renewable energies to provide an energy efficient village venue, the hub for activities in Gilsland. 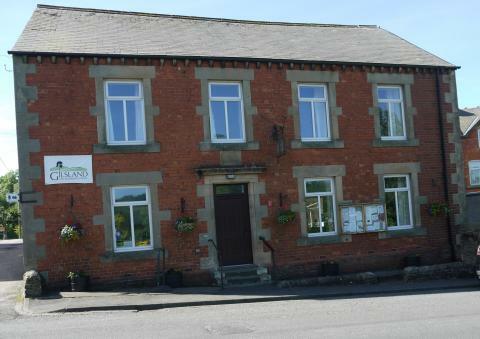 The village hall is spread over two floors with a large upstairs hall ideal for large groups, parties, sporting activities, dances, etc., and a comfortable downstairs hall with disabled access, ideal for smaller groups, meetings and some of our regular clubs and services. The hall has full internet facilities and WI-FI available. We are a fully registered Charity, registration number 1147873 and are currently working towards achieving the Hallmark Quality Award.